Wait till baby groundhogs are old enough to leave the burrow before starting the eviction and exclusion process. You’re probably aware that it would be wrong to close a burrow when a groundhog may be hibernating—usually between November and February, except in far southern states. But you may not realize how important it is to avoid closing a burrow in months when mama groundhogs are tending to their dependent young—usually from late winter through early summer. If you attempt to seal a burrow at this time, you may prevent her from feeding her babies, causing them to die a painful death of starvation. Or, she may furiously undo your burrow-sealing efforts while trying to reach them, making more work for you. As with most things in life, timing is everything. Allow her to finish raising her young to the point they can be on their own—usually by early July. Between early July and late September should be safe for attempting to get groundhogs to leave a burrow. These shy animals prefer lots of cover, so once the timing is right, removing vegetation and other items from around burrow entrances will cause the burrow to seem less homey. There are a number of other effective—yet not cruel—methods of harassing groundhogs, too, and they work best in combination. 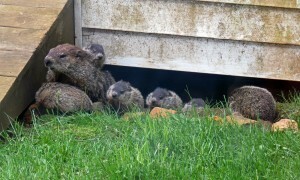 Once you’re sure your groundhogs have left, you’re clear to go ahead and seal up burrow entrances. This has to be done in a fairly specific way or the keen nose of another ground hog will detect the burrow and she’ll open it up—even years after it has been filled in. With the right materials and approach, though, you can foil even a very sincere digger. 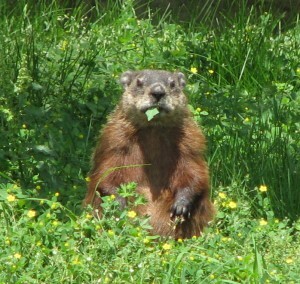 Yep, groundhogs (AKA woodchucks) are pretty darn cute when not dining in your garden or flower beds. For specifics on both harassing and burrow sealing, check out “Looking to Get Rid of Woodchucks?” (Again, woodchuck, groundhog, what’s in a name?!) You’ll also learn how to protect your veggie garden—and that’s something you can do with a clear conscience, even while mama ground hog is busy caring for her young. Heck, once your veggies are safely protected maybe you’ll decide that your groundhog tenants are kind of amusing to have around.